Bees, like ants and wasps, play a significant role in pollination and display a perfect model for community living among insects. Their colonies are intricately designed and incredibly well organized. Read on to know more about bees, their different types, breeding habits, the risk they pose to your, and how you can get rid of bees when they invade your home. How Do You Identify a Bee? Bees in Your House? Be Prepared! How Much Does it Cost to Bee Removal? Bees have been in business for a long time, around 30 million years approx.! An average worker bee produces about 1/12th teaspoon of honey in their lifetime. Killer bees can get pretty aggressive chasing people as far as ¼ miles if provoked or excited. A bee sting is often more fatal for the bee; some species die after stinging as the stingers are attached to their abdomen is ripped away. Bees can see all colors except red. Identifying bees takes a lot of practice and careful observation. For starters, there are about 200,00 species of bees spread all over the planet. Secondly, bees are often confused with wasps and other winged creatures due to the similar behavior and physical appearance. Belonging to the super family of Apoidea, under the order of Hymenoptera, bees have six legs, 2 compound eyes (made up of thousand minuscule lenses on either side of the head), three simple eyes on their head, a set of antennas, two pairs of wings, a nectar pouch and stomach. Some bees also have stingers attached to their abdomen. Bees are observed in shades of black or brown with a tinge of red, sometimes yellow sporting stripes and bluish patterns. Megachile Pluto is said to be the largest bee measuring about 3.9 cm long, while Perdita Minima is the smallest about 2 mm long. Bees are an essential and indispensable part of the ecosystem; however, that does not mean you have to share your house with them. A beehive inside the property can be very inconvenient and pose serious threats to the inhabitants of the house. Identify the species before you begin the bee control program. Once you have enough information about the type and breeding ground of the bees, you can apply various extermination techniques to curb them. Removing the bee hive is the best way to control the infestation; it requires a lot of planning and specialized equipment. As discussed earlier, there are about 20000 different types of bees spread all around the globe. Moreover, while all bees have a common structure, there are certain features and behavioral characteristics that set them apart. Bees are winged insects that collect pollen and nectar for food their hairy bodies, and many eyes help them identify the target flowers quickly. Very similar to ants and wasps, the bees belong to the same family Hymenoptera. The structure of the bees differs according to their habitat and function assigned to them. Honey bees represent only a small percentage of the bee species and are mainly responsible for producing honey and building the hive using wax secreted by the worker bees of the colony. Measuring about 15 mm long, they have a unique oval-shaped structure that is distinctly noticeable due to the golden yellow bands around their bodies. Moving on to the anatomy of the bee, bees are blessed with two sets of eyes- a compound eye for identifying colors, light and directional information while simple eyes help them understand the amount of light present. The set of antennas assists them to detect the various smells wafting through the air and adjust their flight speed. The thorax consists of the legs and the wings to control their movements while their abdomen has the reproductive organs and stingers. Honey bees mate during flight, the new queen who is roughly 6-16 days old, takes to the skies to meet her suitors or drone bees (who are assigned the only job to mate with the queen). She eventually mates with 10-20 drones after which they die as their appendage or endophallus is ripped off the abdomen once the act of mating is complete. The entire reproduction cycle of the beehive depends on the queen bee; she can determine the success of failure of the whole colony! The millions of sperms collected in her oviducts are either immediately fertilized or stored in her spermatheca. She lays her eggs in an oval-shaped cone as she moves through the comb looking for empty cells. Worker bees then place honey, royal jelly and food for the larvae on the edges of their cells. The unfertilised eggs turn to drones while the ones that are fertilized can be either worker bees or queen bees. Once the stored sperm is finished (it lasts up to 4years), the colony starts raising a new queen who will eventually leave the hive and take flight again repeating the whole process. Honeybees have a perennial life cycle, i.e. the colony thrives as the bees are replaced in a perpetual cycle. A colony has three kinds of bees, the queen bee, the worker bee and the drones. Queen bees are responsible for laying eggs, drones for mating with the queen, while the workers build the cells and provide food for the queen and her larvae. The lifecycle of the honeybee begins once it is hatched; the digestive system, nervous system, and outer covering are developed in the initial stages. Each member has its growth, and deterioration period, for instance, queens emerge in about 16 days while drones take up to 24 days and workers require 21 days to mature into adult bees. The drone dies immediately after the mating worker bee live about four weeks while queens can survive a couple of years. Bees have been a significant part of the world for a long time now, in fact, if it were not for bees we humans would not have existed at all! From producing honey and wax to pollinating the flowers, bees play an important part in maintaining the balance of nature. Mentioned below are the different kinds of bees that inhabit the earth. Bumblebees are large fuzzy and hairy insects easily identified by their bright yellow and black striped bodies. Seen mostly on flowers, bumblebees pollinate plants and gather nectar to make honey. However, they do not produce honey in large quantities like the honeybee. Their massive bodies with long hind legs are loaded with pollen grains. Also, female bees have a stinger attached to their abdomen, unlike males who are unarmed. The bees build their nests every year and do not swarm in large numbers like honeybees; you can find a couple of male bumblebees hovering outside the nest waiting for the females to emerge and mate with them. Owing to their large size and black hairy bodies, bumblebees are often confused with wasps, carpenter bees and hornets. Bumblebees build their nests in dry, protected and remote cavities both above and underground. The colonies, though similar, are often smaller in strength compared to that of honeybees. The bees metamorphose from eggs to larvae, pupa, and full-grown adults. Bumblebees are not particularly aggressive; they are quite content buzzing over flowers collecting nectar and spreading pollen. However when provoked the bees can get defensive and even sting to protect their nests. Bumblebees have relatively simple nests build from dry grass, withered leaves, porch cushion, and other insulation material. They live in close quarters with humans and can be found in attics, abandoned buildings, discarded mattresses and concrete slabs. Therefore the best way to deal with a bumblebee hive is just to let it be. Foraging the combs without supervision is a bad idea as the bees might attack and the sting is painful. Ever noticed correctly drilled holes in the wooden planks along the door hinges and eaves? Carpenter bees measuring about an inch and weighing just a few grams are responsible for the handiwork! However, the bees do not feed on the wood; they drill holes to lay eggs (btw, most carpenter bees are females). Also, it would be wrong to call them wood-destroying insects and comparing them to termites, the damage done by carpenter bees is usually limited to the surface and has no effect on the structure and foundation of the house. In the US you can find two kinds of carpenter bees Xylocopa (large, 12-25 mm) and Ceratina (small, 8 mm) whose presence is associated with property damage. The bees are found in shades of black, greenish black, metallic blue or purplish blue. You can even find yellowish hair sprouting on their legs, thorax, and abdomen. The black almost glossy hair on their belly is a distinct feature differentiating them from bumblebees. Carpenter bees, like other bees, feed on nectar and plant pollen. They build their nests on isolated dry and protected wooden structures such as window sills, railings, racks and decks. The bees prefer fir, Cyprus, redwood, oak and other kinds of wood that is unpainted or unfinished. Their lifecycle depends on the climatic and environmental conditions of the place and can last as long as seven weeks. Moreover, Carpenter bees are solitary creatures unlike their cousins and hence have a low reproductive potential. People usually associate the entire bee species with the honeybee, however surprisingly they make up only a fraction of the bee species inhabiting the planet. Members of the insect class Insecta, bees belong to the subfamily of Apinae. They are responsible for collecting pollen, building hives from wax and producing and storing liquefied sugar or honey. Their large oval-shaped bodies measure about 15 mm. The light brown frame with golden yellow bands and brown stripes give the bees their distinctive appearance. The flashy lines warn predators from invading their hives and stealing the honey. The combination of simple and compound eyes give the insects leverage over other winged creatures such as wasps and flies. They are better equipped to deal with light rays, colors and wind speed. The pair of antennas perched on their heads takes care of their olfactory senses. The mandible jaw can cut through the hard wax and is used for feeding the larvae, cleaning the hive and fighting. The thorax is comprised of legs and wings while the stinger is attached to the abdomen. Their hives are constructed on remote corners of property away from humans using the wax produced by worker bees. Honey bees are extremely social insects and live in colonies following a strict hierarchal order where each bee knows its place and job. For instance, the queen bee lays eggs, drones mate and worker bees build nests, collect food and take care of the larvae. Setting up of a bee hive inside or near your house can be dangerous because it ensures a constant presence of many flying insects inside and around your house. One single bee colony usually contains around 8,000 to 60,000 bees, and sometimes even more. People who are allergic to bees hence have to remain extra careful as a single bee sting can lead to severe health problems such as vomiting, closing of the throat, breathlessness, unconsciousness, choking and even anaphylactic shock or cardiac arrest. A bee sting releases a compound called apitoxin in the blood stream which contains high amounts of intense toxins, and if an average person is stung ten times at once by a bee, it might also result in an allergic reaction which can even result in death. Bees are organized pests so getting rid of them by traditional methods do not usually work. Prolonged presence of a bee hive inside your home can also lead to permanent damage on the walls, roof or even chimneys which can only be solved through a complete renovation. Besides this, the strong odor of the hive also tends to attract other rodents and dangerous insects. Bees usually sting only as a form of defense. Male bees and the queen bee do not usually sting humans. When a bee stings, the stinger, which is directly connected to the bee’s digestive system, and the venom sac are pulled out of the bee which results in immediate death of the bee. When this happens, an alarm pheromone is released which alerts the other bees present in the colony. They then attack and gather around an area to defend the colony. The sting can be painful and the poison inserted in the blood stream usually results in swelling, itching, and redness. If a person is stung multiple times, it is best advised to consult a doctor immediately. That’s because an allergic reaction can also result in severe health problems and if left untreated for a long time, can also lead to death. The natural tendency of bees is to develop colonies in tree hollows and cavities in other structures. Bee infestation around or inside your house can be damaging to your health and to the infrastructure of your house. As bees as diurnal, removal of a hive can be best executed after dark. How to Get Rid of Bees From Your Home, in the Ground, Car? The best method to get rid of infestation of bees in your home, in the ground or even inside your car (bees tend to gather and take up residence in the small gaps present in between car doors for example) is by making the environment inhospitable for them to survive and breed further. The best method is to not attack the bees or the hive. When they sense danger, they will attack and sting the person present near the hive. You must block all the entry points for other insects and rodents by filling all gaps that might be present near windows, doors or chimneys. If, even the bees are not able to enter the house once they have gone outside, they will automatically work to relocate. To ensure that infestation does not happen again, use chemicals to remove pheromone smell left behind by the bees. The best way to get rid of infestation is by consulting the pest control authorities or the local beekeepers. Ground nesting happens through entry patches in bare soil. Do not use pesticides, but instead, simply water the area. Bees prefer dry lands to make a hive. A wet ground will thus prove to be an inadequate place of residence for them. Remove bee infestation from your car by adding chemical smell that would repel bees and by filling all gaps around car doors so that no space is left for the bees to be able to breed within or at the side of the car. Bees usually do not form a hive inside cars, and any swarms that might be present will relocate within a few days. The best advice hence is to not use threatening force as they might sting to defend themselves. A dense cloud of bees and swarms can prove to be unnerving. The first rule to dealing with a beehive is not looking at the hive, for it has been scientifically proved that when bees are constructing a hive, they are harmless and are merely looking for a safe place of residence. The primary reason for any bee to sting a human being is when a bee feels that it is under threat. It’s summer time! The sun is shining bright. And the bees are buzzing right. For they are one of the hardest working creatures of this planet. And we humans rely on the humble bee pollination to sustain the food chain. However, it does become a bit of an inconvenience to humans at times when they start building their nests in and around the houses. This method is perfect for trapping the yard bees but not really suitable for a home garden. Slit out the top part of a large bottle of soda. Turn this portion upside down inside the other cut portion of the soda bottle. Hang it like a funnel and staple. Fill in the funnel up to a couple of inches with sugary soda. This will attract the bees to fly into the funnel and they will not be able to come out. Hang it at the most commonly invaded places like the entrance of a yard or a doorway. Another challenge that might occur if you get rid of the bees from a tree nearby your house is the unsettling honeycomb scent that is bound to attract new bee colonies. This creates an indefinite problem. Resolve this by nailing a stainless wire mesh over the hole and then covering it up with a filler material that does not entice other critters into eating their way through the material. The common bee-attracting places can be gardens (gardening lovers, take note), a recently evacuated bee colony, flowers, etc. However, if at all you happen to be in the vicinity of these places, then ensure that you wear body covering clothes, closed boots or shoes and the required gardening wear (if gardening or cleaning the yard) like gardening gloves, etc. As much as you love planting fragrant lovers, the bees love it too. Flowers with high level of fragrance strongly attract them. 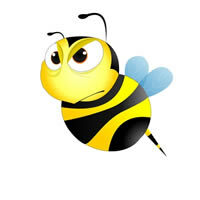 Another tip would be to avoid planting any flower with the word “bee” in its name. Consider trimming the trees that attract bees so it would decrease the number of flowers produced. This is one of the best natural ways of getting rid of bumble bees. Ensure that you wear body covering; protective clothing as there are chances of the bees getting agitated. Spray the mixture on the bee colony in the night when the bees are slumbering. The mixture can also be sprayed on the nearby flowers, plants and bushes that might attract the bees. Avoid getting stung by wearing a face mask, full pants and a long-sleeved shirt. Although this isn’t the easiest way of getting rid of the bees but it is one of the safest ways of keeping the bees at bay. Most plants and flowers are naturally made to seem attractive to the passing bees. And that’s why there aren’t too many plants available that repel bees. However, following are some of the options you can consider. These are strong smelling plants whose aroma discourages the bees from being in their vicinity. A lemongrass variety named Cyboposon nardus. This is made from the best bee repellent plant called wormwood. Combine 8 oz. Of wormwood leaves with four pints of water. Boil and simmer this mixture for thirty minutes. Let the solution cool and strain. Mix in one teaspoon of castile soap and place it in a spray bottle. Spray this on the bees directly. This can be used anywhere in the house. Caution: Do not use this mixture on young plants and the plants that are going to be consumed by humans. The absinthe in the wormwood is toxic for humans and stunts the growth of young plants. If you thought that bad smelling plants/flowers were of no use, then think again. They are one of the best natural bee repellents. The carrion flower and dragon arum are plants that the bees would never get attracted to. The flesh colored flower of the carrion plant produces an odor of rotting meat. Other flowers that produce a similar odor are the male flowers of the carob tree (Ceratonia siliqua). The dragon arum plant (Dracunculus vulgaris) produces a blood red bloom and smells like excreta. This requires careful planning since you need to consider the options of bee repelling plants. Create a border of strong smelling plants around the garden space. Crush the plant leaves and stems to ensure that the oils are released into the space. A bee-free zone can be created just about anywhere. All you have to do is place the bee repellent plant in the bee attractive zones like door exits and entrances, yard borders, windows, near the bee colonies, etc. This is one of the easiest ways of driving the bees away (not really suitable for large bee colonies) since they hate the smell of mothballs. Take a few mothballs, put them in an old used cloth or a sock and hang it in places that are most susceptible to bee invasion. Like yards, on the porch, door entrance/exits, windows etc. In cases of large yards, you may have to use more than one moth balls. You can also use them in storage spaces or hang them from trees. Caution: Mothballs can pose danger to humans. Keep them away from children and avoid the strong-smelling fumes they emit. Keep bees at bay by smoking up the bee prone areas. The smell of smoke will delude the bees into thinking that their hive is on fire which will make them leave and find a new colony. Bees will flee from the smoke, become less aggressive and unconscious if they inhale too much of it. You can use a traditional smoker or a liquid smoke. A traditional smoker is a simple metal container with bellows attached and used to light a fire. Liquid smoke needs no lighting. Light a smokey candle or build a campfire. This will keep the bees away because of the unattractive scent of smoke. Candles such as Citronella candles are most commonly used as bee repellents. If the bee colony is too huge and downright dangerous to personally handle it, then seeking help from an exterminator is the best option. However, this does come with a disadvantage of the exterminator killing the bees. Also, a professional bee extermination can be expensive depending on the size and the location of the bee colony. However, there are some genius pest control services that understand the importance of bees on ecology and just get rid of them without killing them. It is advised to keep the bee killing exterminators as a last choice. Best for personal use and to avoid bee stings, this home remedy will keep the bees off your skin. Mix in vanilla extract with water and apply it over your skin. If you do not like the smell of vanilla, use baby oil. Baby powder is also quite effective in keeping the bees off the skin. Do make sure that the baby powder is organic and is completely natural. These three options are best for keeping bees away from small areas like window/door openings, yard entrance/exit and certain areas of the garden. Use cucumber peels in the above mentioned specific areas and any other small area of your choice. Peppermint’s strong fragrance keeps the bees away. Plant them around the garden to create a bee free zone or inside and around your house. A great advantage is that the peppermint will leave your house smelling delicious. Chop up garlic and soak it in water for a couple of days. Place this mixture around the required small areas. This makes for a great bee repellent. Another best way of getting rid of the bees is by attacking the hive. This is suitable for ground bees. Mix two cups of water with two cups of peppermint castile soap and boil it in a kettle with water. The boiling soapy water is perfect for killing the bees. Ensure that you change into protective clothing and completely cover your skin as much as possible to avoid getting stung. First pour in a mixture of regular water and soap into the nest. And then pour in the boiling water. The boiling water assists in spreading the mint oil deeper into the nest. In this method, you place tarps over the hive, and bricks and stones in the vicinity of the tarp. Most effective if done in the night because the bees are off to sleep when you’re placing the tarps. This prevents agitation of the bees and chances of getting stung. Also do ensure that you wear dark clothes so you draw as much less attention to yourself as possible. It is best done if the task is taken up by more than two people. Bees are extremely attracted to food sources and strong, sweet smells. You can use sweet fruits to get rid of bees in small areas. Cut up a sweet, ripe fruit like a pear or a mango into small pieces and put them in a bag. Leave this bag about 20 feet away from the hive. Move the bag further away after a couple of days and repeat the process until the bees have relocated their hive. Sprinkle some cinnamon at the spaces you think are prone to attract bees. Like gardens, bee hives, yard openings, window frames etc. Keep the cinnamon sprinkled for at least a week. The smell will force the bee to relocate their colony and obstruct them. Hang bug zappers around the house, yards, window frames or around any bee zones. These electric devices attract the bees with their sweet scents and leave the bees electrocuted. Below are a couple of natural ways to ward off bees from home sidings. Use the bee trap method or different kinds of bee repellent sprays as mentioned in the above points. You will need to wear protective clothing while using these sprays. Use insecticide solutions. They are easily available in the local stores around. This should preferably be used in the night when the bees are dormant to avoid the risk of getting stung. Since the solutions are toxic to human health, it is advisable to keep yourself properly covered while performing this activity. Also, ensure that you wash your hands properly after finishing. It takes nearly a week for the solution to successfully kill all the bees. You can use D-Force HPX to kill the bees in your garden. This, however, should be considered as the last resort since the chemical kills the bees. It is an insecticide that is put in a pressurized can. The active ingredient, Deltamethrin, is a synthetic pyrethroid which attacks the bee’s nervous system, paralyzes it and eventually leads to the bees’ death. The chemical can be used in just required specific areas like directly applying it to the nest or on the bees themselves. D-force can be used anywhere without the risk of being toxic to humans since it is used only in certain areas. It provides 8 weeks of protection. Please make sure that you keep this away from pets and kids. It is vital that you wear protective clothing while using the chemical. Instead of using D-Force, you can also use other bee insecticides. Please ensure that you read the instructions clearly before using them. Bees are said to be important for the ecosystem; the reason being the fact that plants receive pollen from them, which is necessary for their growth. But then again, if a group of bees infest your house and build a hive, then that can result in severe danger faced by you. If this happens, you should immediately seek professional help for bee removal. Before getting a professional help for bee removal, you first need to understand what it is that you are dealing with. You have to be sure that they are bees and not hornets or wasps. Once you are sure of the presence of bees, you need to call a local beekeeper. Honey bees are said to be rapidly disappearing, so the local beekeepers would be happy to save an endangered species besides helping you. So it is win-win situation for both the parties. If in some cases, the local beekeepers are unable or unwilling to remove the hive, then you have to call a professional exterminator who will most probably kill the bees before attempting to remove them. There is a possibility of you not getting a good local beekeeper or you are unwilling to pay a professional exterminator; cases like these, you can do it yourself by using pesticides to kill the bees, but you have to know the right way to do so as it may turn out to be hazardous. Since bees have become an endangered species, there are times a local beekeeper would happily remove a bee infestation for free and charge you for just the travelling. They might also do it for free if they notice the existence of a healthy bee colony that they can take home. Note that if the hive has been sprayed with pesticides, the local beekeeper will not get rid of the infestation for free as the bees won’t be healthy. There are some beekeepers who would charge you approximately $75-$200 for locating the swarm and capturing it. There might arise few situations where the beekeeper or exterminator has to cut holes in the building to remove the bees and their honeycombs. For this, they might charge you $100-$700 depending on where the bee nest is located and how many bees have infested that area. Since bees are beneficial for the environment, many professional exterminators prefer live extraction of the honey bees from their colony. However, there are cases where this might be impossible or prove fairly difficult to carry through. Cases like these, the exterminators might charge you around $100-$300 or even more. Beekeepers might remove the bee hive for free but they may the leave the reconstruction and repair costs if any to you. Before calling a beekeeper or an exterminator, do some online research and understand the cost involved. Bees, though crucial for maintaining the balance of nature, can pose serious threats for the inhabitants if they infest a personal property or commercial undertaking. The reclusive bees prefer staying away from humans. However, there might be times when bees build a hive inside or around your home. Want to get rid of that honeycomb built up the attic? You might want to know more about these FAWs. Contrary to popular belief, not every bee is a honey bee; in fact, honey bees only make up a small portion of the bee species inhabiting the planet. Surprisingly, honey bees are among the most endangered insects in the world. From pollinating plants to making honey, bees are an indispensable part of the ecosystem for over 30 million years now. Moreover, bees are often wary of humans and don’t attack unless provoked. They pose no threat to the property, and you can co-exist. However, if you still wish to get rid of the nest, try calling in professionals who can relocate the hive to a safer habitat. Does Plugging The Hole Help? Most people believe that bees can be trapped by just plugging the entrance hole of the hive. However, bees are smarter than that! They can work out a different exit route and escape through a crack or small opening. Bees usually move on towards the light and enter your living space through window sills, gaps in the dashboards, vents and electrical outlets. Blocking the hive is not only impractical and futile but also downright cruel as the bees might suffocate to death inside in case they fail to break through the honeycomb. Beekeepers Can Rehabilitate The Hive? The best way to tackle a bee infestation is by calling the nearest commercial beekeeper service, the team of beekeepers are trained to handle bees and have all the necessary equipment and attire to protect them from the stings. Beekeepers also help maintain the honeybee population and extract honey from the hives. Having a hive at your home can be profitable! You get to preserve the lives of bees and get free honey for it. On the downside, hiring a beekeeper can be heavy in your pocket as the team does not guarantee liability insurance in case of any damage to the property. Is It Illegal to Kill Honey Bees? Not exactly, but because the population of honey bees is dwindling at an alarming rate, it is best that you rehabilitate them. Honey bees and bumblebees usually hover over flowers and plants collecting nectar. Spraying chemicals and pesticides over the garden just to get rid of the bees is not a smart idea. Bees help to carry the pollen grains and are an important part of the plant lifecycle. Exterminating bees or adding hazardous insecticides on the flowers will only hamper the ecological balance of the place. Why Are Simple Bug Sprays Ineffective In Curbing the Infestation? A bee colony can be exterminated using over-the-counter bug sprays if the hive is built within a wall. However, if the hive has been for some time, it is likely that the bees have filled the empty cells with wax and honey. The size of the honeycomb depends on the time frame that it gets to develop and grow. Only spraying pesticides on the over-covering of the hive is ineffective to curb the infestation. Abandoned hives can have as much as 40 pounds of pure honey by the end of spring! How Can I Keep the Bees From Re-Entering? Your work does not end with just removing the hive and driving the bees away; they might return once the effects of the chemicals wear off. The best way to prevent the chances of a re-infestation is by removing all traces of their hive from the property. It includes cleaning the premises of abandoned honeycombs, wax droppings and residue before you begin the repair work. The presence of combs or the odor can attract bees for years increasing their chances of return. By thoroughly cleaning out the cavities and sealing it tight you ensure that the bees never return. 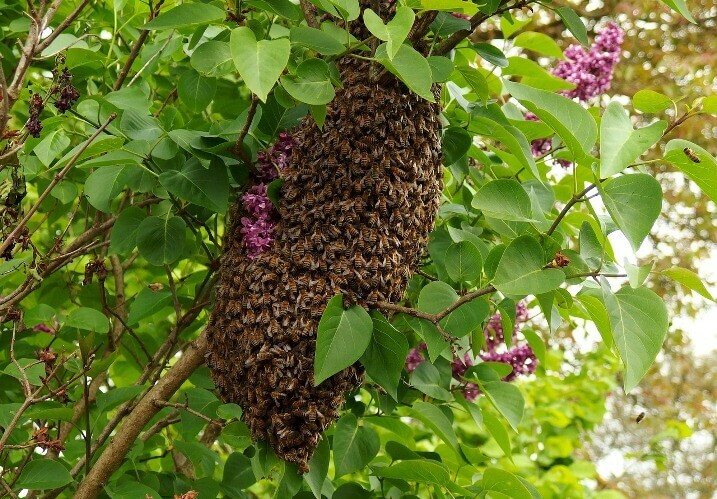 If you notice a swarm of bees or a big hive inside your property let it be. Don’t go around unnecessarily provoking them to react. Bees are naturally docile and elusive creatures unless they sense some harm to the hive, then they get aggressive and might sting. Also, bees do not usually hover around in swarms except in the mating seasons that is sometime during spring. In case any member of the family is stung, apply cold water or an ice pack to the area immediately before ringing for the doctor. Why Do Bees Build Their Homes Near Water Bodies? Honeybees usually choose to make their hives near water bodies such as lakes, pool sides or streams. The water cools the nests down and also serves other bodily needs. This is why many of you must have noticed bees swarming near pool sides or other areas of the house that has large amounts of water collected in one place. Beekeepers help remove the hives and rehabilitate them near natural water sources. What Are The House Netting Insects That Are Mistaken For Honey Bees? There are about 200,000 different species of bees spread over the world. Before you begin the bee control operation, identifying the bees that have built their home on your property should be your priority. Honeybees with their large hairy bodies and golden yellow stripes are easily recognizable. However, they are very similar to yellow jackets and can be easily mistaken for wasps. Wasps, like bees, build their colonies in isolated cavities and corners, although their hives do not have honeycombs and their nests die by early spring.